Cost: $60 which includes 2 day camp, (6 hours instruction) and a free camp t-shirt. -Due to limited space in our Indoor Facility, we ask that spectators/parents leave during the camp. SIGN UP TODAY: Contact Riders head coach Nate Perleberg at 307-689-4542 or email at nperleberg@ccsd.k12.wy.us. Limited spots available for this camp. *TO SIGN UP CONTACT COACH PERLEBERG nperleberg@ccsd.k12.wy.us or text 689-4542. Note from Coach Perleberg.....We are excited to offer another year of the Riders Baseball Academy which will run for 4 weeks (practice twice a week) in January. We will continue to go with the twice a week format to better retain the information that they are learning. So your child will receive 8- 1 hour group practices/lessons over a 4-week span for $150. (That is less than $20 a session!) This is a great opportunity for your child to receive quality instruction right here in Gillette. I urge you to sign up today as spots will fill up fast. Contact Coach Perleberg at nperleberg@ccsd.k12.wy.us or text 307-689-4542 to sign up. Instructor- Allen Hemeyer- Allen is the head assistant coach of the Gillette Riders. Hemeyer is entering his 6th year on the Riders coaching staff. Last season, the Riders pitching staff broke an all-time record with a staff ERA of 2.27 for the season. The Riders have also had the Wyoming PItcher of the Year in 4 of the last 5 years. In Hemeyer's four years as JV coach he led the Rustlers to their highest finishes in program history. In 2014, the Rustlers won the State B Championship and in 2015 finished 3rd in State at the A level. In 2016, Coach Hemeyer again led the Rustlers to a 2016 State B Championship. His 2017 team, again qualified for the "A" State Tournament. In 2018, Hemeyer helped lead the Riders to a "AA" State Runner Up. Allen was a four-year starter for Spearfish Post 164 baseball before attending college at Mount Marty in Yankton, SD. Hemeyer was a three-year starter at DH and 3B,while being a conference starter on the mound for the Lancers. Instructor- Sam Stearns- In his first season as head coach of the JV team, Coach Sam Stearns led the Rustlers to a 48-23 overall record and a Wyoming B State Championship. Coach Stearns has close to 20 years of coaching experience, spending many years coaching in the state of Colorado with Premier West. He currently teaches P.E. at St John II Catholic School and helps run our off-season lessons and Riders Academy. Coach Stearns played collegiately for 4 years at the University of Northern Colorado. RIDERS BASEBALL ACADEMY- Started in the fall of 2013 to provide quality off-season instruction to players ages (9-18). The Academy has two 4-week sessions (twice a week), in January and February. The Academy allows players the chance to work in personalized settings with Riders coaches to improve their skills during the offseason months. All lessons take place at the Riders Volunteer Fieldhouse. 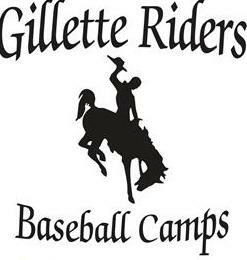 Instructors will include the Post 42 Coaching Staff and Riders/Rustlers players. NO NEED TO REGISTER IN ADVANCE, JUST SHOW UP AT CAMP WITH CONSENT FORM. ALL PLAYERS WHO PARTICIPATE IN THE CAMP WILL ALSO RECEIVE A FREE T-SHIRT. NOTE- Players need to bring their own bat and glove. Also please dress accordingly for weather.